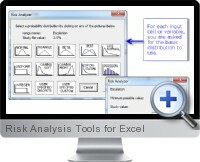 Excel Risk Analysis Tools provide a menu item in Excel with add-ins for various risk and sensitivity analysis functions for applying to existing data models. Risk analysis tools include What-If scenario simulation reporting as well as charting tools for visualizing risk within data and business models. The risk analyzer tool runs Monte Carlo simulation quickly over data models with a variety of distribution options and output histograms. Flexible configuration for decision modeling includes the setting of input and output variables and specification of minimum and maximum constraints. The sensitivity analyzer tool performs multiple what-if analyses for up to 5 input cell variables. Start, step and end values can be specified to constrain output scenarios as required. The multiple goal seeking tool is designed to fit models based on desired or required outcomes by testing combinations of multiple input cell values. Goal seeking can be used to quantify the risk of input values from the scenarios generated. The sensitivity chart creation tool creates tornado or fish bone sensitivity charts to quickly visualize the sensitivity of individual components for a business or data model. The component sensitivity charting is ideal for performing and conveying value driver analysis. The histogram charting tool accurately displays non-normal distributions for isolating outliers and identifying trends. The waterfall charting tool helps to display changes in variables between time periods or another dimension. Additional charting tools include a bubble chart creator for displaying multiple dimensions for analyzing risks and a cascade chart creator to compare components within data. The Mekko chart tool further enables display and analysis of 3 dimensions. Further tools included relate to complex formula checking and auditing, Excel file organization and access as well as task management. All of the risk analysis tools are provided with step by step instructions and example implementations to quick grasp implementation and application to business data models.